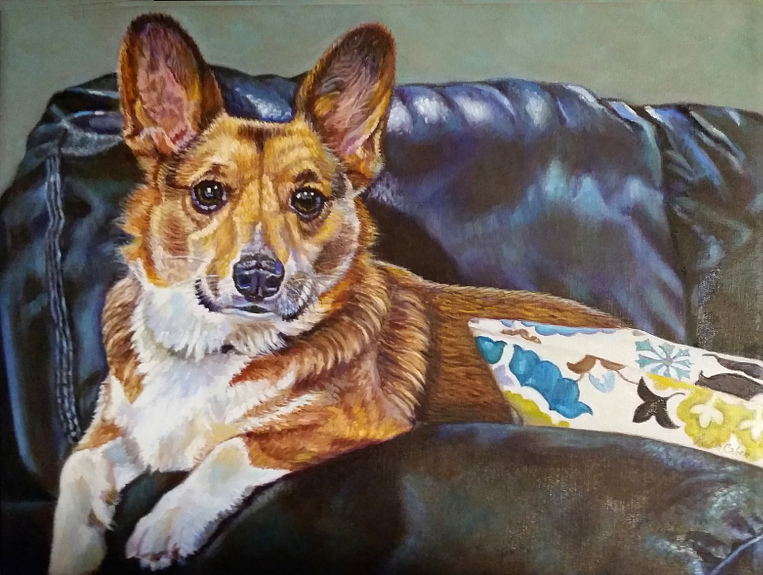 Loki the Welsh Corgi was one of two dog portraits that I was asked to do as a Christmas gift in 2016, for a local client. The leather couch was a new challenge for me as a texture…and I am always up for trying new ones, since each of them is a good learning experience. I really enjoy doing portraits of 4-legged family members, especially when the photo I am given to use has good detail and clarity like the one I used for this commissioned oil painting. I also like to do some research whenever I do pet portraits, since it makes the dog, cat, or horse in the photo, more real to me than just being an image. I also try to get as much information about the relationship between the owner and their pet, because it helps me feel more connected to their pet and their personality. As the name says Corgis, of course, were originally from Wales, Apparently there are two types, Pembroke and Cardigan, with the Pembroke being the more popular of the two. In fact, the Cardigan Welsh Corgi appears on The American Kennel Club’s list of ‘Vulnerable Native Breeds’ of dog. There are definitely some noticeable physical differences between the Pembroke and Cardigan varieties, according to the breed standards. The Cardigan being larger overall, both in weight and in height, but both types have very short legs; hence the name Corgi, which is Welsh for ‘dwarf dog’. Traditionally, the tails of each were of different shapes, but docking became popular making it difficult to know whether the dog was born as a bobtail or with a long one. Generally speaking, the Pembroke is not born with a tail, and the Cardigan is. Additionally, the ears of the Cardigan are rounded, whereas they are pointed in the Pembroke. Interesting fact: Queen Elizabeth II, has personally owned more than 30 Welsh Corgis, either Pembrokes, or Corgi-Dachshund crosses (aka “Dorgis”).